How can we help students to adopt strategies for keeping their head up when they want to shut down? This is the question that NYC teachers and counselors in the 2016–17 Advanced Academic and Personal Behaviors Institute are tackling. We all know the feeling of reluctance that can arise when we are about to take on something we haven’t mastered yet. The way students learn to deal with this sort of challenge affects their schoolwork in the present as well as opportunities down the line. This school year, teams from nine public NYC middle, high, and transfer schools are working closely with Eskolta facilitators Alicia Wolcott, Jessica Furer, and Katie Gleason using improvement science methods featured in Anthony Bryk’s book Learning to Improve: How America’s Schools Can Get Better at Getting Better to help their students develop habits, skills, and beliefs for confronting challenges and achieving success in school and life. 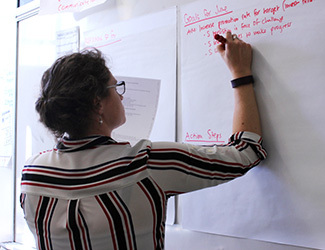 As participants in the Institute, a partnership between Eskolta and the NYC Department of Education’s Office of Postsecondary Readiness, the teams are learning research-based practices for building student persistence and positive learning mindsets. 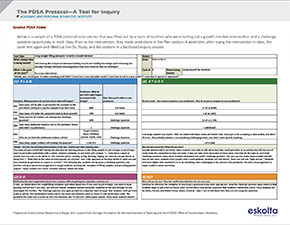 In the process, they are increasing their own capacity to make and sustain improvements within their schools using a sequence of steps drawn from improvement science methodology: define and learn more about the focus problem, pilot a small change in iterative cycles, and collect and reflect on data from the experience. At Cypress Hills Community School, a Spanish/English dual-language school in Brooklyn for students in grades K–8, the teacher team chose to focus their work on one of the schoolwide practices, “turn and talk.” The practice is meant for students to build their language skills, but the team had noticed students often were simply going through the motions, saying a single word and then glancing at the teacher as if to say, “I’m done.” One of the classroom tools that Institute members had access to was a set of sentence stems for launching an idea. Because every student at Cypress Hills is a language learner, having a sheet to reference specific ways to start a discussion was useful. In two classes, students were asked to refer to a set of sentence stems during short discussions and later check off which stems they used. Teachers on the team collected data and made observations and are now experimenting with ways of adapting the practice by selecting more targeted stems or finding ways to accurately collect data. One of the realizations they’ve had during this work is that the practice not only builds students’ language skills, but allows students to take ownership over their learning, engage in it more deeply, and make it more meaningful for them.